The Washington Capitals beat the Philadelphia Flyers 3-1 Sunday afternoon in the District. 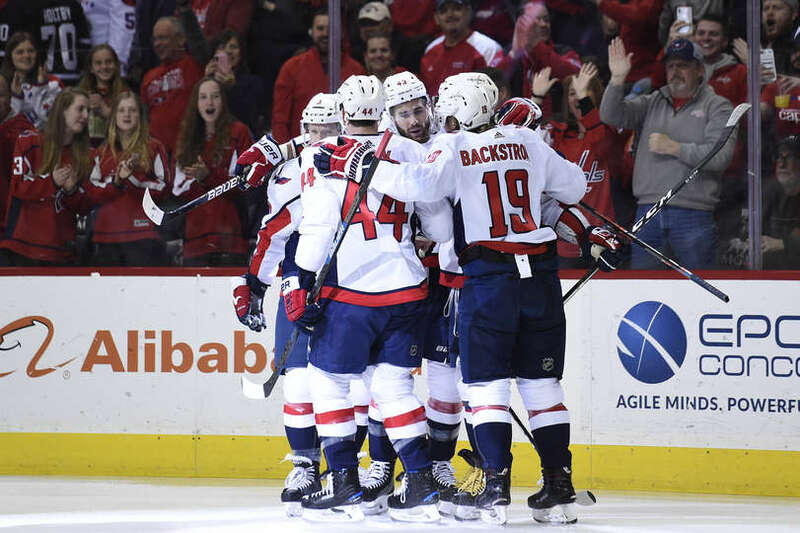 The win improves the Caps record to 44-24-8 (96 points) on the season. The Capitals next hit the ice on Tuesday when they wrap-up their four-game homestand against the Carolina Hurricanes. Game time is 7:00 PM. Scratches: Michal Kempny (lower body), Tyler Lewington (recalled on Saturday) and Dmitrij Jaskin. The Capitals opened the scoring with a redirect goal from Tom Wilson at 3:52 of the first period. Wilson re-directed a shot from the point by Nick Jensen, who had the primary assist on the goal. Alex Ovechkin was credited with the second helper. And that would be all of the scoring for the first frame. Shots on goal were tied at 11 each. The Flyers led in shot attempts 15-9. The Capitals were 0 for 2 and the Flyers 0 for 0 on the power play in the first period. The Flyers controlled and at times dominated possession since the Capitals tally. The Flyers shot attempts continued to outpace the Capitals for the second period. However, the Capitals would make it 2-0 on a redirect from Travis Boyd at 10:47 of the middle frame. Matt Niskanen (16) and Nic Dowd (14) were credited with the helpers. The Flyers would get on the scoreboard with a power play goal from Jakub Voracek at 17:10 of the second period. The middle frame would expire with the Capitals hanging on to a 2-1 lead. The Flyers led in shot attempts 37-9 and shots on goal 20-7 for the middle frame. The Flyers were 1 for 3 and the Capitals 0 for 2 on the power play after two periods. The Capitals would stretch their lead to 3-1 on a breakaway goal from Jakub Vrana at 8:07 of the final frame. The goal was setup by a nice feed from Brett Connolly. And that would be the final. Jakub Vrana scores his 22nd goal of the season, and the Capitals now have four players with at least 22 goals (Alex Ovechkin, T.J. Oshie, Tom Wilson and Vrana). With an assist on Boyd’s goal, Nic Dowd has reached the 20 point mark (6g, 14a) for the second time in his career (2016-17: 22 points as a member of the Los Angeles Kings). Nick Jensen picked up the primary assist on Wilson’s goal, his second straight game with a primary assist. He now has 16 assists on the season, a new career high. Got to talk to Peter Bondra before the game. This entry was posted in Game Re-Caps, News and tagged Jakub Vrana, Jon Sorensen, Philadelphia Flyers, Tom Wilson, Travis Boyd, Washington Capitals. Bookmark the permalink.